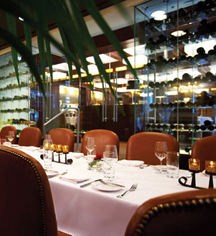 Dining at The Pfister Hotel is a world-class experience with a variety of gastronomical options to please every palate. Adjacent to The Pfister Hotel, Mason Street Grill serves up classic American fare in a warm atmosphere with welcoming staff and comfortable seating. Known for delicious wood-grilled steaks, special sandwiches, and housemade desserts, this exciting eatery hosts a lively eclectic line-up of live jazz six nights a week. Casual and convenient, The Cafe is situated near the entrance of the hotel and offers a Starbucks barista counter and a patisserie. Open daily, a Breakfast Patisserie Counter Menu is offered from 6:00 AM to 11:00 AM featuring scones, breakfast sandwiches, and more. From 11:00 AM - 8:00 PM, The Cafe Pfister Bakery Menu is available featuring soups, sandwiches, salads, housemade gourmet pastries, and desserts. A traditional dining section of the cafe, with seating, is open daily from 6:00 AM to 2:00 PM serving The Pfister’s classic menu. 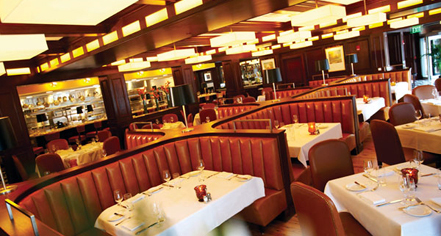 The Pfister Hotel serves an elegant and classic Sunday Brunch buffet, in the historic dining room, The Rouge. Featuring over 40 delicious items, the brunch menu includes a carving station, made to order pasta and omelets, fresh fruit and cheeses, a decadent array of desserts, and the classic mimosa, and a special signature bloody mary bar. With an inviting fireplace, comfortable couches, and live piano music, the Lobby Lounge is a cozy retreat to enjoy beverages, light appetizers, and the beautiful performances by Dr. Jeffrey Hollander. Voted Milwaukee's Best Romantic Bar and Best Views, trendy martini bar Blu is situated on the 23rd floor of The Pfister Hotel boasting spectacular panoramic views of downtown Milwaukee and the serene Lake Michigan. Furnished with rich wooden fixings and comfortable wing-back chairs, this elegant bar is known for its classic cocktails, inventive martinis, and an extensive wine collection. Adding to the relaxing ambiance of the lounge, live adult contemporary music is available on the weekends from 8:00 PM to 12:00 AM.